RI has been manufacturing premium quality micropipettes since 1998. ICSI-Plus™ injection micropipette features include a parallel section for fine sperm control, a sharp bevel utilizing RI’s unique bevelling technology, a sharp spike and a consistent opening diameter with no closing or deformation near the tip where the spike has been formed. Non-spiked versions are also available. Manufactured in an ISO 14644 Class 7 clean room using close tolerance borosilicate glass with a 1mm OD. All micropipettes are MEA tested on a batch basis using the highest industry pass mark in MEA – at least 80% of the test embryos must reach blastocyst stage. The batches are also certified free of endotoxins by the LAL test. Micropipettes are sterilised by an approved gamma irradiation facility with ISO 11137 certification. 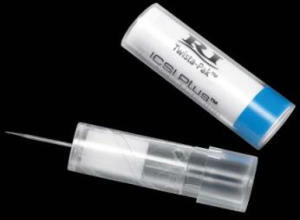 Unique Twista-PakTM operates like a lipstick, faciliating 100% damage-free removal of the micropipettes from the packaging and is colour coded for immediate visual inspection. Shelf life is 3 years from manufacturing.